1. Go to the Song List. 3. Type the language you want to find into that box. Translations are provided by site users (bless them!) because I don’t speak these languages. Study the translation thoroughly to be sure it says exactly what you want it to say. If you have a translation you would like to submit, contact me using the link at the bottom of the page. If you’re looking for Spanish translations, typing Español or Espanol into the “refine this list” box works. Currently, all other languages are listed only under the English equivalent–so “German,” not “Deutsch,” etc. Eventually this will be fixed, but hey… this stuff takes awhile! Translations are usually at the bottom of the “Sheet Music Download” tab. They usually begin with the word “Translation,” and end with the language name. Usually. I do tend to be a bit inconsistent. 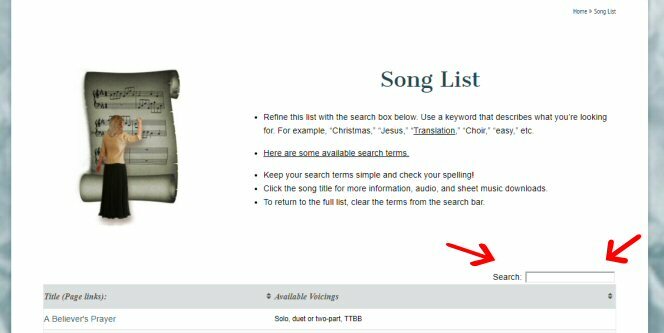 One helpful hint: If you open your song choice in a new tab (right click, choose open in new tab, or just middle click on some browsers), you can return to your refined list more easily. Hi Sally! Thanks a lot for making available your arrangements. Blessed be you for this! As I play the piano in my stake’s choir, we will rehearse your arrangement for Abide With Me for presenting in the stake’s conference next June. I need to translate it into Brazilian Portuguese and I’m wondering how to do it. Can you please send the files and instructions by mail? Sally, I LOVE your scores and you interest in those of us who are always looking for the next choir arrangement! I am not “highly computer literate” and could not follow your instructions to change the key on a song. Will you please put it out to us one more time? Thank you so much for your love of music and compassion for all of us who love your music so much!!! It’s also linked on the right sidebar.